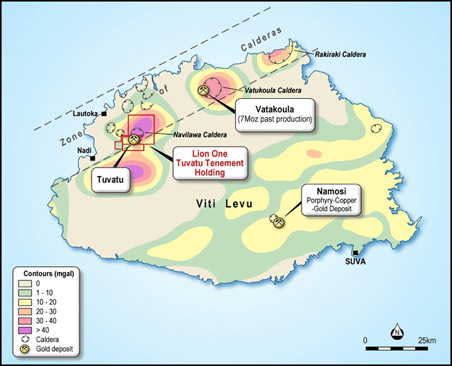 Lion One Metals Limited is set to become the premier high grade gold producer in the South Pacific island nation of Fiji at its 100% owned and fully permitted Tuvatu Gold Project. Lion One is focused on cost effective and environmentally responsible construction, development, and advancement of Tuvatu towards production, coupled with exploration of its district-scale license areas covering the highly prospective and underexplored Navilawa volcano. Tuvatu is the largest undeveloped gold project in Fiji and one of highest grade gold projects anywhere in the world; focused on building production of 100,000 oz. per year over ten years. Envisaged production based on 600 tpd CIL operation yielding recoveries of 86% with up to 40% of gold recoverable through the gravity circuit. 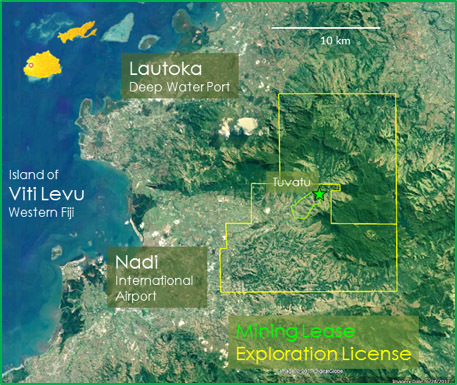 Lion One holds a 200 km² exploration license package covering the entire Navilawa volcano, with the Tuvatu mining lease at its center. Proximal to urban infrastructure 24 km from the town of Nadi and International Airport, 35 km from the deep water port of Lautoka. 100% owned, fully permitted for construction, mining and processing operations with 21-year surface lease, subject to a 5% government royalty and 3% export tax. Porphyry to epithermal gold deposits hosted within the eroded remnants of the collapsed Navilawa volcano, with approximately 80% of known resource within 200 m of surface. Outcropping veins extend laterally over 1km inside the Tuvatu mining lease with anomalous gold evidenced over 6 km x 4 km inside Navilawa crater; limits on mineralization have not been defined and remain open at depth and along strike. The Tuvatu Gold Project (lat.17º43’S, long.177º35’E) is located 24 km NE of the town of Nadi on the island of Viti Levu in the Republic of Fiji. 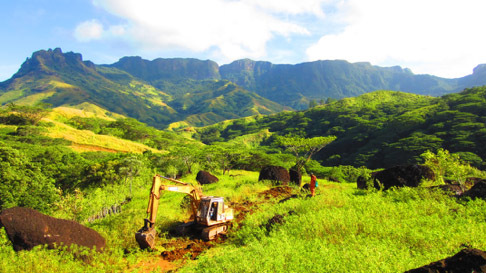 The project lies between elevations of 100 and 600 m in the southern reaches of the Navilawa volcano, overlooking the Sabeto River valley and town of Nadi on the western coast of Viti Levu. The area surrounding the Tuvatu gold deposit, resource area, and underground is covered by a 3.85 km² Special Mining Lease (SML 62), with the broader project area covered by 200 km² of Special Prospecting Licenses (SML’s 1283, 1296, 1412 & 1465), including the Navilawa license area acquired in November 2017. 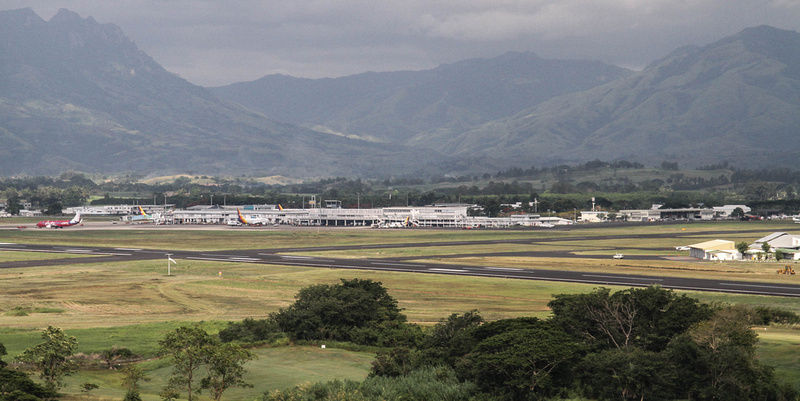 Permanent mine site facilities at Tuvatu are accessible by a service road connected to the Queen’s Highway a total distance of 15 km from the Company’s head office, located 1.5 km from Nadi’s International Airport. Fiji lies on the boundary of the Indo-Australian and Pacific tectonic plates, a zone marked by seafloor spreading and transform faulting. The Fiji islands are at the midpoint of the opposing Tonga Kermadec and New Hebrides convergence zones. It is separated from these actual convergence zones by two extensional back arc basins, the North Fiji Basin to the west and the Lau Basin to the east and a series of transform faults including the Fiji Fracture Zone and the Matthew Hunter Ridge. Approximately five million years ago (Miocene/Pliocene Period) the area was the site of a number of major volcanoes, formed along a northeast – southwest trend. Tuvatu is one of several epithermal gold systems associated with alkaline rocks along the NE trending Viti Levu lineament, Fiji’s own 250 km long gold corridor. A number of gold deposits have been discovered along this trend including Tuvatu, Vatukoula and Raki Raki. The Vatukoula or Emperor Mine has produced over 7 million ounces of gold since 1937. Tuvatu is a large gold bearing vein system hosted in the eroded remnants of the Navilawa volcano, one of Fiji’s largest hydrothermal volcanic systems and second largest gold deposit. Mineralization in the Navilawa volcano is characterized by an early porphyry stage driven by the emplacement of alkaline intrusive stocks, with subsequent epithermal stages driven by sector collapse and lateral spread into permeable units at the contacts of the monzonite intrusive. Gold mineralization is dominantly hosted in the monzonite (alkaline granite-like rocks) but also occurs in the adjacent volcanics. Mineralization is structurally controlled occurring as sets and networks of narrow veins and cracks, with individual veins ranging from 0.04 m to 9.0 m true width with a mean of 1.1 m. Lode mineralogy is varied, with most veins containing quartz, pyrite and base metal sulphides. A high proportion of the gold in the deposit occurs as either free gold or is contained in quartz or pyrite grains that can be extracted by simple floatation followed by cyanidation or direct leaching. Free gold present is both fine and coarse grained although sample assay repeatability is very good suggesting most is fine grained. The main mineralized zone (Upper Ridges) comprises eleven principal lodes with a strike length in excess of 500 m and a vertical extent of more than 300 m. Another major zone of mineralization (Murau) strikes east-west and consists of two major lodes with a mapped strike length in excess of 400 m. A total of 39 different lode structures have been identified in the Tuvatu resource area including 11 lodes in the Upper Ridges area, 3 lodes in the Murau area, 4 lodes in the West area, 2 lodes in the Tuvatu area and shallow dipping veins in the SKL area. Numerous additional lodes have been identified but require further testing to merit inclusion in resource estimates. The Tuvatu mineral resource has been estimated for each vein individually using ordinary kriging of width and grade, the latter using accumulations, into a 3D block model. The Tuvatu resource is reported at a 3 g/t Au cutoff representing a resource amenable to underground production. The June 2014 Tuvatu resource estimate reported an indicated resource of 1,101,000 tonnes at 8.46 g/t Au for 299,500 ounces of gold and an inferred resource of 1,506,000 tonnes at 9.70 g/t Au for 468,000 ounces of gold. Access to the mineralization at Tuvatu will be made from two declines from surface and internal declines, with two ventilation raises to surface. Level access drives are designed at dimensions sufficient to enable the use of medium-sized loaders for improved productivity and truck loading close to the stoping area. The primary planned mining method is shrinkage stoping with limited breast stoping for flat dipping lodes. Shrinkage stoping is a manual overhand method that relies on broken mined material being left in the stope to provide a ‘working floor’ and support the stope walls. Man and material access into the stope is from pre-developed raises. Production drilling is performed using air-legs (jacklegs). Mineral extraction is from crosscuts driven at closely spaced intervals into the bottom of the stope. During the mining cycle only 30% to 35% of the blasted material is extracted, equivalent to the broken swell factor. When mining to the top horizon is completed, the remaining material is extracted. These mining methods provide the greatest control to enable commercial scale selective mining that minimizes dilution and maximizes ore recoveries and grade. The processing facility has been designed as a conventional two-stage crushing and screening circuit, followed by two-stage grinding to achieve a target grind P80 of 75μm. The grinding circuit, which includes gravity recovery, then feeds flotation where a sulphide concentrate is produced and reground to 80% passing 20μm prior to entering the Carbon-In-Leach (CIL) circuit. Both the flotation tails and concentrate are leached, with the concentrate CIL tails recirculating to the feed of the flotation tails CIL circuit, the combined discharge being pumped to detoxification and dry tails deposition. The process facility is designed with a nominal capacity of 219,000 tonnes per year for a nominal design rate of 600 tonnes per day based on an overall availability of 91% with a life of mine average feed grade of 11.3 g/t Au. The plant is designed to operate 365 days per year, 24 hours per day. The crushing circuit is designed with a mechanical equipment availability of 75% but has been sized to process 1,000 tonnes per day to accommodate any future expansion. Ninety-nine percent of previous work on this large project area has focused on the Upper Ridges, Murau and Tuvatu lodes. However, reconnaissance work has indicated the presence of more than 20 other mineralized systems on 100% mining or exploration titled land within in easy trucking distance to the Processing Facility location. With the Tuvatu Gold Project now under construction, Lion One is turning to focus its geological effort into the surrounding land package. The Company is working systematically through the regional exploration in order to identify potential ore sources that could complement and grow the Tuvatu Gold Project. The Company has a set a target to convert Tuvatu to a project that can produce more than 100,000 ounces per year over ten years. Lion One was recently awarded the exploration rights to the Navilawa Caldera (collapsed extinct volcano). This area has been the subject of several exploration phases by previous companies, that has identified multiple gold and copper mineralized systems but remarkably, very little drilling has occurred in this area. In addition to Banana Creek, the Company is also reviewing the extensive copper mineralization at the Kingston workings, the Central Ridge area and other peripheral targets. 290 Vein – rock chip samples up to 290 g/t gold hosted in Nadele Breccia. Kubu – 100 m wide zone with 10 mineralized structures with assays up to 9.90 g/t gold. Wailoaloa – the intersection of the UR7 and UR8 lodes with the HT Corridor area with gold in soil anomalism over wide areas. The area to the west of Tuvatu is geologically dominated by the Sabeto volcanics and the mountain range of the Sleeping Giant. There are several prospects and old diggings in this area. Exploration in the Tuvatu area began in the early years of the 20th century with prospecting and artisanal mining in the upper reaches of the Sabeto River and Navilawa Caldera. 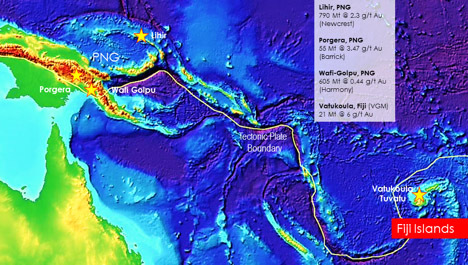 The discovery outcrop at Tuvatu was discovered in 1987 by Geopacific of Australia after investigating a soil anomaly originally identified by Aquitaine Fiji in 1977. Geopacific entered into an option agreement with Emperor Mines Ltd. of Australia in 1995. Emperor exercised its option to purchase 100% of the Tuvatu tenements in 1997 and incorporated a subsidiary, the Tuvatu Gold Mining Company Limited (“TGM”), to manage the property. During this period Ivanhoe Mines Ltd. was the majority shareholder of Emperor. Underground development started at Tuvatu in 1997 with an exploration decline driven to a depth of 240 m below surface. Geological mapping and systematic channel sampling of the underground was carried out with a total of 588 samples exceeding 1.0 g/t Au, 214 samples exceeding 10.0 g/t Au, and 32 samples exceeding 100 g/t Au, with a maximum value taken from a sample grading 840 g/t Au over 0.60 m. To date a total of 1,341 m of decline, strike and rise development has been undertaken in the project area, and in exploration decline. Further subsurface exploration and development took place throughout 1999. Trial mining, bulk sampling, and metallurgical testing took place in 1999, with a feasibility study on underground gold mining and processing operations for the producing gold doré completed in 2000. In total TGM completed 51,484 m of diamond core drilling and 9,265 m of RC surface drilling, as well as 13,407 m of underground drilling. To date over 100,000 m of drilling has been completed at Tuvatu. In 2001 during a period of low gold prices TGM was placed on care and maintenance by Emperor. In 2007 following the closure of the nearby Vatukoula gold mine, which by then had become a subsidiary of DRD, Emperor sold its Fijian assets including the Tuvatu property to Red Lion Management Ltd. of North Vancouver, BC. Licenses covering the Tuvatu property were re-issued in the name of Lion One Limited by the Fijian Government. Subsequently American Eagle Resources gained control of Lion One Limited, the holder of the Tuvatu project. Lion One Metals is the product of the reverse takeover of X-Tal Resources by American Eagle Resources in January 2011.